According to data supplied by Famitsu, the Japanese games market has hit its lowest point since 1989. In 2015, games in Japan generated ¥321bn - a 13 percent decline on 2014's total of ¥368.55bn. Sales of games dropped 16 percent to ¥191bn, while games hardware was down to to ¥130bn - a 8.5 percent dip compared to the previous year. These figures indicate that the Japanese games sector is at its lowest point in 26 years, falling below 1989's ¥358bn. It all sounds a bit depressing, but such data doesn't give the entire picture. Crucially, these figures do not include digital sales; boxed games remain incredibly popular in Japan, but smartphone gaming has exploded in recent years, and it's very likely that many consumers have simply taken their cash to that side of the market instead of spending it on physical games, thereby explaining the steep drop-off in these figures. In terms of software, Capcom's Monster Hunter X (2,441,977) and Yo-Kai Watch Busters (1,965,202) led the pack. 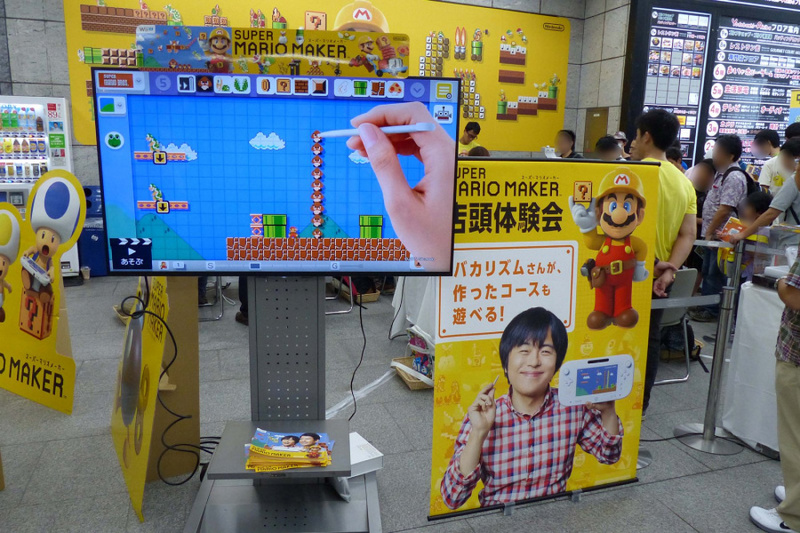 Two Wii U titles made the top ten - Splatoon (1,064,897) and Super Mario Maker (674,194). Hardware-wise, the 3DS was king with 2,189,900 units sold, while the PS4 was second with 1,205,163. Surely there are some missing zeros at the end of that Hardware list? Famitsu Regularly print digital sales and they're a tiny percentage of physical sales over there, so there's not that hope to cling to. Mobile has been killing the traditional market over there for quite some time. @Great_Gonzalez No. There is definitely something wrong with those numbers, as the Wii U did 100 000 in the week of Christmas in Japan. Last week alone, it sold 53547 units according to Media Create. Not surprised at the Xbox One coming in last in hardware sales. Most people in Japan would have to rent a 2nd apartment just to have the space to keep the damn thing! @Frank90 Yeah! And this time, it managed to reach half a million! Xbox One is smaller than PS3 FAT and only big difference in size with PS4 is height. Both PS4 and Xbox One take near same sized area from table and look huge bricks compared to WiiU. That's sooo depressing! I really hope digital sales make the difference. People aren't willing to even pay money on games anymore! Just playing those free to play games and then they complain about the fact that they have to pay money to unlock more content!! And then they complain about the quality! Well smartphones/tablets don’t have buttons and the market isn’t willing to pay more than £2 on a game. Developers cannot just giveaway every game for 100% free. Mobile gaming… it’s not proper gaming! Consoles and PC is much better. @kupocake @DrkBndr @MJKOP The original source is wrong, I'm checking with them now to get the correct numbers and will update accordingly. Cheers! This is one of the few thing that I don't like about Japan.. People over there have a serious problem of ''sheep mentality'' where every time a new fad breaks off, everyone and their mother will run after it, trying to not be left behind.. Mobile gaming is just one of them, other recent fads are their creepy obsession with food and cheap plastic stuff that screams ''made in China''..
Wow. Am I reading correctly that every software title in the top 10 is for Nintendo hardware? @aaronsullivan well yes, I think that is the least surprising thing in this article, Japan's taste in games at least hasn't changed much over the years, yet Sony have moved further away from what they want. What were the games Sony made last year, and can you imagine them being popular over there? Until Dawn? The Order 1886? Uncharted Collection? Heck even Bloodborne has nowhere near the amount of pull as Monster Hunter or any of the franchises in that 10. Persona and Final Fantasy will be the ones to watch next year for Japan. I don't get it. What do people play on their Sony consoles? Do they buy PS4 just to stare at it? Gaming is vastly more expensive in Japan and Korea than in the West. Electricity in Japan is way more expensive than what we pay in the U.S.
Japan as of December has entered into it's 5th economic recession in 20 years, though unemployment remains one of the lowest in the world. Japanese wages have remained stagnate since the bust of the 1980s. Japanese work slightly more than they did in the 1990s, working more hours than their counterparts in developed countries. Japan is really have structural and societal issues that the government is afraid to tackle. Though these issues that affect Japan are also hitting the rest of SE Asia, especially China and South Korea. @Socar Dear god! Don't even say it! Anything but Fire Emblem on Mobile. Will likely be the Japanese economy, that will be the reason. MS needs to drop out of Japan already, stop embarrassing yourselves. Those numbers are awful and who are you trying to prove to that you can do it year after year? Even some of the worst have done better than that in a year. Albeit they're not the complete worst, but still. @Freeon-Leon They propably play monthly PS+ indie games until Kingdom Hearts and those two FF games are released. It could be interesting to see what will happen if those games will also be released for NX at same time. PS4 & Xbox One are already halfway their lifecycle at that point and to be fair awaiting greatness has taken too long already. Pleased to see Fire Emblem Fates there in the top ten, even if it's barely made it. Interesting how all top ten is all games on Nintendo platform, yet, PS4 and Vita hardware sales has been decent this year. It seems the lack of diversity made games on Nintendo platform sell better overall, and third party also seems to only want to spend their time on high profile or franchise that guaranteed to sell well in Nintendo platform. Smaller games or experimental games seems to be all reserved to Sony platforn instead. Guys: The top 10 games are all on Nintendo platforms. Pretty impressive for a doom-and-gloom topic like this! It's odd that the term gaming market does not include Smartphones and tablets. Gamers play games but not all gamers can afford all platforms so they go for what is popular. Smartphones games are popular, free'ish, good graphics on a large screen, mobile and addictive. But I still think the 3d games are the best, so I tend to stick with my 3ds if there is a game I like. If not I have a 5.7 inch smartphone, good for games like plants and zombies. Regarding the home console, I would like to return to the N64 type games but with HD graphics; and the N64 controller. Games were simpler and more fun then. If the NX was the N64 with HD graphics and simpler games, and controller like those from the N64 days it would fly off the shelves. The Mobile market is classified as a separate market in each territory. The buying habits and developers are different from regular gaming. Monster Hunter X digital sales were really big given the stock shortages of the game's physical copies (it is already the 4th best selling 3DS eShop game ever...in less than 2 months). Minecraft on the PS Vita and a few small 3DS eShop only releases (The Battle Cats, Cube Creator 3D etc.) also sold pretty well digitally, but other than that, digital sales are not very big in Japan. Games I imagine. Meta critic isn't an exact science of course, but the PS4 has 116 games with a score of 80 and above*. First party output may be thin but choice of games isn't a problem. Xbox has that annoying, huge power brick too. That's nearly as big as the Wii U on its own. There's something in the design that makes it look massive. Not even close. Xbox One power brick has ~1cm more height and 10cm less width/lenght than Wii U console itself and Wii U has two power bricks which combined are bigger than one power brick in Xbox One. Sure there will be few people in japan who don't have that extra 3cm to put Xbox One in place of PS4 but propably bigger reason is that japanese gamers like to buy japanese products and play japanese games. Doesn't surprise me in the slightest: The majority of Japanese that play games do so on mobile. Simple, cheap games. Look at Sony: Over here 90% of their games is made by western companies, and Japanese companies let western companies work on their franchises (Castlevania, Devil may cry etc). Because Sony does focus on the west now, Japanese people aren't interested in home-console games anymore. Personally I think its a loss, and I really hope that the Japanese return to their consoles. Moreso, Japanese people should start making great games for the consoles again and they should work on their franchises again. They where once the masters, they should rise again. Oh, and please no nitpicking. I am just generally speaking, there are always exceptions!